For a doctor, one's proudest moment may be when they graduate from a school of medicine and receive the diploma that they hang on their office wall. For a doctor, one's dream could be to find the cure for a disease once thought to be uncurable. For a doctor, one's delight may come from seeing a patient walk away from the office with a smile they had never shown before. For a doctor, one's biggest nightmare is a patient like Mel. Unwell Mel isn't a terrible guy, really. He isn't uncooperative with his doctors (although one could say his diet might be a little off), and he at least has the determination to see the necessary practicioners to get his ailments cured. Mel's biggest problem is that he has just about every medical malady in the book, if not the whole bookshelf. Treating Mel is a rather simple process, especially for those familiar with match-3 games. In the grid comprised of Mel's organs (some of which are shaped like dogs and birds, which we'll assume is normal), click two adjacent pieces of food to swap them and form a line of three in a row to clear them. 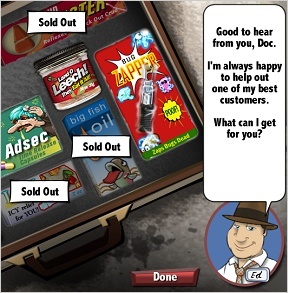 Thrown in with the food are medical packs, which can restore your power-ups, and bugs that, in some instances, actually help you clear away disease. In each level, you are given the task of clearing away all of the gunk from a level, clearing a certain number of bugs from a level, or both. Gunk, the discoloration of tiles on the grid, is cleared away by making a set of three or more on top of that particular tile. In addition, you may need to break away the crud that covers a tile before you're able to do anything with it, by either making a set with the item encrusted in the crud, or blowing the crud up with a bug or power-up. Power-ups come in two different forms. Power-ups on the board can be formed by creating sets of four or more items. Clearing four can get you candies which act as wild cards, coins which add to your score and help you buy items, and explosives which can clear out items and crud. Clusters of five can earn you money bags of coins to grab, candy bags that spread wildcards around the board, powerful blue pills that alter time and space, and more. You can also purchase power-ups from Ed, the local salesman, who's got all the tricks you need to knock out gunk and bugs. Analysis: One of the things that adds to the appeal of Unwell Mel is the punny wit of the diseases themselves. Whether you realize it or not, thousands (or hundreds... dozens? A couple?) of people suffer from Carpool Tunnel, Footen Mouth, Retrogameritis, Tickle Me Elbow, and yes, Hypochondria ("The good news is, you're not a hypochondriac..."). 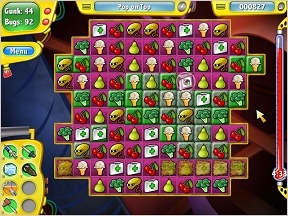 It's possible that the difficulty level for this game might be just a shade on the easy side, given the large amounts of time to complete each level. But while some levels can be passed with little effort at all, others might catch you off guard with their surprising difficulty. Much of the difficulty is offset by the use of the power-ups you buy, but being able to use them becomes a greater challenge, since you must restock your power-ups between uses, and whether you win or lose a level, they don't automatically reset. This means that if you lose a level having used down all of your power-ups, you start the next level with nothing. While it isn't impossible to recover from this situation, it is a definite setback. For those of you concerned about Unwell Mel being another depressing primetime medical drama, fret not, this game works hard to be cheerful and light. Beyond the punny humor lies a chipper soft jazz soundtrack and characters that you can't help but love. The same dev studio behind Fairway Solitaire crafted this game, so that gives you a good idea what to expect in terms of quality. As you work to dream the impossible dream and cure the uncurable Mel, you'll have a good time doing it. Give Unwell Mel a try, and experience the joy of being one of the world's finest doctors for someone who really, really needs it. "You don't have permission to install games from Big Fish Games on this computer. Please log in with an administrator account and try again." Nice solid, match 3 game. Very impressed with the polish and art style. I am stuck on the Ghost face level. Anyone got a clue as how to get past it? It's frustrating that it's impossible to clear the block at the far corner since you need 3 same pic to clear the block. How am I going to do it? Has anyone ever gotten past level 69 (Ghost Face) in Unwell Mel game. I've been playing it for months and can't beat it. Why don't items from the Salesmen work on this level? I am totally stuck on Ninja Gas. Can anyone help? The rest of the game has been relatively easy but this level is killing me. Strategies, tips, or tricks????? Thanks!